I’m sure I’ll soon start droning on at length again about various moments of defeat and longing from my past, but right now I’m kind of sick of the word I. It happens sometimes. It happened in a primordial form all the time when I was a kid, and I escaped my I-ness in various ways, including deep plunges into my baseball cards, especially those that included names so cartoonishly exotic that they could never be confused with being from the same world as my own. So here’s the king of those names, Sixto Lezcano, 23 years old, looking young and confident, as if he has never in his life gotten sick of being the person inside the word I. He has just completed a 1977 season in which he swatted 21 home runs in just 109 games. He seems to sense that he and the Brewers are poised on the brink of a breakthrough season. In 1978, with Lezcano providing stellar defense in right field and a .292 average at bat, the Brewers recorded not only the first winning season in the history of their previously nondescript franchise but a blistering 93-win campaign that would have catapulted them into the playoffs in many other years (or even in the same year had they been a member of the American League West). But this 1978 season by the Brewers has pretty much been lost to history, eclipsed by the battle royale that year between the 99-win Red Sox and 100-win Yankees. The Brewers got even better the next year in what would be Lezcano’s finest season (he drove in 101 runs and finished 15th in league MVP voting), tallying 95 wins, enough to pass both the Red Sox and the Yankees in the standings. Unfortunately, the Brewers’ excellent 1979 season is also obscure, as they finished a distant second in the division behind a Baltimore Orioles squad that won 102 games. It was a tough time to get noticed in the AL East: the following year the Orioles would tally 100 victories and have to settle for second behind the Yankees. The Brewers, still good, still unnoticed, finished far behind both with 86 wins, a dropoff for them that could be attributed to the dip in play of Sixto Lezcano, whose average plummeted from .321 in 1979 to .229 in 1980. He was traded in December 1980 and so wasn’t around when the Brewers finally broke through with half of a division win in the strike year, then a trip to the World Series in 1982. In the World Series the Brewers fell to the Cardinals, the team Sixto Lezcano had been traded to, but he wasn’t on that team either, having been traded again to the Padres. The Padres made it to the World Series a couple years later, but by then Sixto Lezcano had been traded to the aging, fading Phillies. The Phillies, composed mostly of geriatric former members of the Big Red Machine, made an improbable run, or walker-limp, to the World Series the year Lezcano joined them, but even though he played well in limited action during the regular season he seems to have been left off the postseason roster (correction: as pointed out in the comments below, Lezcano actually played several playoff games that year). He contributed the next year as a competent part-timer (from playing Strat-O-Matic I know that he generally raked left-handed pitching) but within a year was out of the league for good. It’s now 30 years since the time of the photo in the card above, 30 years since the dawn of the single golden age of the Brewers. Robin Yount and Paul Molitor and the 1982 pennant-winners are remembered, but who remembers all the wins in the preceding years, years when the charisma of newness and promising youth on the team emanated most strongly from the rightfielder with the cannon arm and mesmerizing name. Who remembers the Age of Sixto Lezcano? 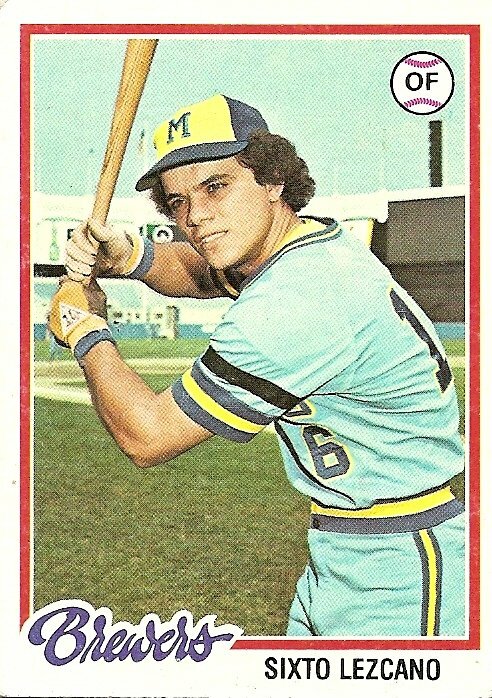 You are currently browsing the archives for the Sixto Lezcano category.